To back up a bit (ok, a lot), SSEC was founded in 1965 by UW professor Verner Suomi, who is widely considered the ‘father’ of satellite meteorology. He developed the groundbreaking ‘spin-scan’ camera that flew on the first geostationary weather satellite, ATS-1. Suomi’s spin-scan camera allowed meteorologists to watch cloud movement across the western hemisphere from space, illuminating storm development and global weather patterns. We now take for granted the weather satellites’ live views of hurricanes when we see them on TV, but it started in 1966 with the spin-scan camera developed here at SSEC. Today, SSEC is still a leader in the field of satellite meteorology. 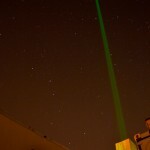 To name just a few of our research projects: we develop algorithms to determine wind speeds observed by weather satellites, new warning products that provide earlier warnings of dangerous thunderstorm development or alerts of volcanic ash clouds, and we continue work on advancing the state of the art in satellite meteorology instruments. Another SSEC forte is validation. We have ground-based instruments we can point at the sky and obtain vertical ‘profiles’ of the atmosphere — for example, are there aerosols or ash particles from wildfires aloft, and if so at what altitude? The data from our ground-based instruments can be used to validate results from other ground-based instruments and instruments flying above on satellites or airplanes. 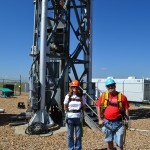 For the FRAPPE experiment, the SPARC was parked at the Boulder Atmospheric Observatory (BAO). Two to three times a day, a NASA P-3 airborne observatory would descend over BAO in a series of spirals as onboard instruments measured air pollution. Stand back, IT guy attempting science! 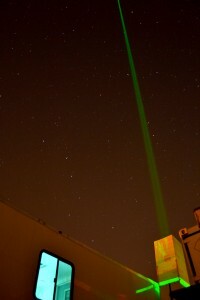 While the P3 spiraled down, two instruments in the SPARC were looking up — the Atmospheric Emitted Radiance Interferometer (AERI) and High Spectral Resolution Lidar (HSRL). The vertical profiles of the atmosphere these instruments provide are important datasets for the FRAPPE researchers measuring air pollution. 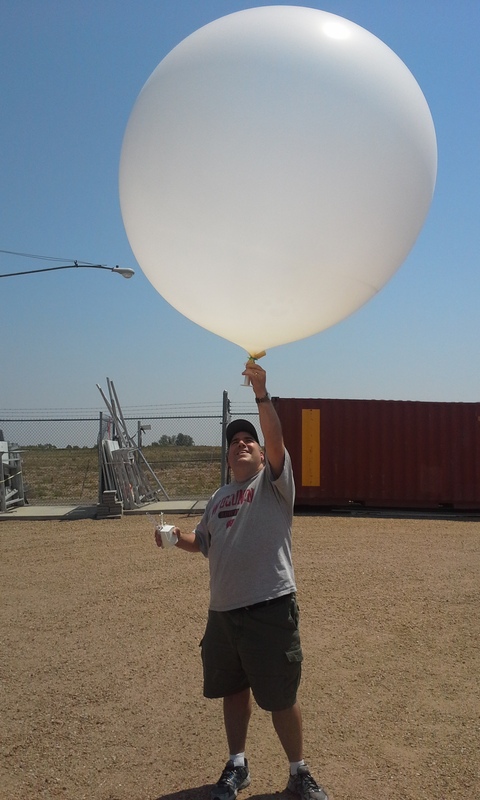 As part of the FRAPPE experiment, we also launch radiosondes (weather balloons) at noon each day to to help validate results from the AERI and provide yet another dataset for researchers. As an IT guy who’s also a bit of a weather nerd, I have to admit I was really geeked out about the opportunity to launch weather balloons. The site manager for the BAO was also nice enough to take visitors up the 300 meter (nearly 1,000 foot) tower for a view from the top. 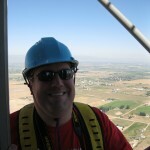 We had to wear harnesses, clip on to safety tethers and climb into a small three-person elevator for the ride to the top. There, we could step out onto small platforms and see the front range mountains to the west and Denver to the south. It was a hazy day, but still a really cool view (and ride). 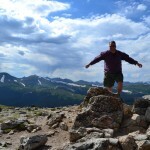 We had some downtime on my next-to-last day in Colorado, so a colleague and I made the short drive from BAO to Rocky Mountains National Park, drove to the Apline Visitor Center and hiked for a few miles on the Alpine Summit and Ute trails. This was my first time hiking in the Rocky Mountains and it was a real treat. I’m not a ‘technical’ hiker, so we kept to some fairly simple trails, but the views were spectacular. 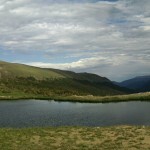 We also came across some snow, a lot of wildflowers, some neat little mountain ponds and wildlife (elk and marmots). 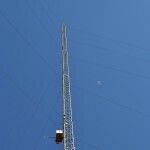 Below, I have pictures from our hike, a few from my trip up the BAO tower, and some pictures of our instruments at work. The SSEC High Spectral Resolution Lidar (HSRL) operating at the Boulder Atmospheric Observatory (BAO) in support of the Front Range Air Pollution and Photochemistry Experiment (FRAPPE), with a cameo by the big dipper. 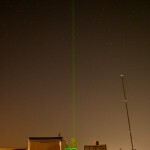 The SSEC High Spectral Resolution Lidar (HSRL) operating at the Boulder Atmospheric Observatory (BAO) in support of the Front Range Air Pollution and Photochemistry Experiment (FRAPPE), with the BAO tower in the background. The BAO tower has an instrument cart that travels up and down the tower, taking atmospheric measurements as it goes. NASA’s P3 airborne observatory is spiraling above. All geared up for the ride to the top of the BAO tower. 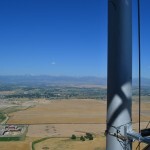 The view of the front range mountains and Erie, Colorado from the BAO tower. 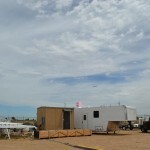 300 meters down, there’s the SPARC trailer (it’s the one with the shiny roof in the middle). The small brown lumps in the field at top are hay bales. 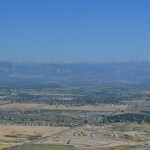 The view of the front range mountains and new housing construction in Erie, Colorado from the BAO tower. At the top of the 300 meter (almost 1,000 foot) Boulder Atmospheric Obervatory tower. 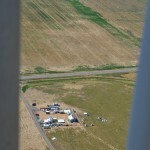 The SSEC SPARC trailer at the Boulder Atmospheric Observatory, with a NASA P3 airborne observatory above. 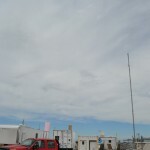 The SSEC SPARC trailer at the Boulder Atmospheric Observatory, with the BAO tower in the distance and a NASA P3 airborne observatory above. At the end of the Alpine Ridge Trail at Rocky Mountain National Park. 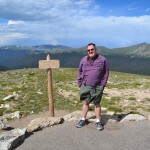 At the end of the Alpine Ridge Trail at Rocky Mountain National Park. It was really windy, I thought I might blow away. We found a small pond about a mile and a half down the Ute trail from the Alpine Visitors Center at Rocky Mountain National Park. 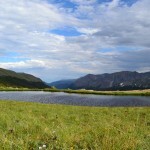 A panoramic shot of the small pond we found about a mile and a half down the Ute trail from the Alpine Visitors Center at Rocky Mountain National Park.